So, on Friday, I fired my agent. Why? Don't get me wrong, I like Sam Fleishman. I could talk to him, he could understand what I meant, what I wanted, and what I wanted to do. Unfortunately, he himself told me he had problems selling anything by nonfiction lately. As much as I would have liked to stay with him until the bitter end, it's been three years of my life. There has been no movement. And I'm only going mildly insane. I need to do something, and, even though I have my own business now, it's not exactly going as fast as I would like (granted, if it went as fast as I would like, I'd be going door-to-door, but I'm told that's frowned on. And illegal in some cases). So, I fired Sam. He was understanding about it. So, while this did not lead to a sudden discovery by a publisher, this did lead to a decision. I'm going to start self-publishing my books. You read it correctly, books, plural. You see, A Pius Man was never a one shot; not only was it a trilogy, it was also the last in a series of novels I had written. Characters like Scott Murphy and Giovanni Figlia had been bit players in two previous novels (though they never met). You can imagine the rewrites I had to put in to make A Pius Man intelligible. It had gone from being the last in a series with people the reader should be moderately familiar with, to a first book published. For example, Maureen McGrail and Sean AP Ryan had met in a comedy-thriller called It Was Only On Stun. In A Pius Man, we only know that McGrail dislikes working with Ryan, and we can only imagine why. Now, you're going to find out. Yes, I am going to publish my first novel, It Was Only On Stun, through a company called Lulu.com. Here's hoping all goes well. I have to do a few things first, like layout design. And I've got two different versions of the book, which means two different openings. And, in case you're wondering, yes, I will be writing under an alias. my real last name isn't easy to spread by word of mouth, now is it? While I am tempted to list this book with a subtitle of A Novel of A Pius Man, I don't think I have quite that many fans. In short, this is not the end. This is not the beginning of the end. But we hope, pray God, that this is the end of the beginning. 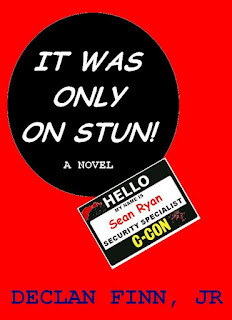 And now, a flap copy (what you see on the back of the book) of It was only on stun! When security specialist Sean A.P. 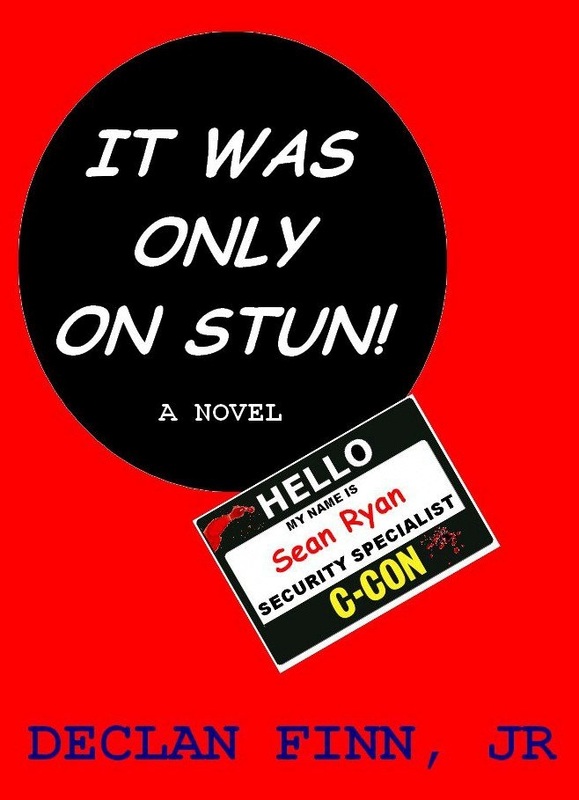 Ryan agrees to protect actress Mira Nikolic at a Science Fiction convention, he thinks it can't be all bad. It's only a three-day weekend with some colorful characters in costumes. But Sean is hardly prepared for what awaits him; the costumes, the fanboys, the freaks and geeks are only the beginning. There are actors with attitude problems, writers with rabies, and how do you spot an assassin when everyone is wearing a mask? This doesn't even account for the real threats. When his client left Europe, she had been a figure of peace in a region that didn't want it. Now that she's an international celebrity, factions from the old country see her as the start of a reunion tour, with guns. Not only that, but she is being stalked by Middle Earth's Most Wanted Elven Assassin; he thinks that the actress is actually an Elven princess, and will do anything to prove it to her, including murder. And what is that body doing in the middle of the vendor's floor with a sword-cane through his chest? What Happened To A Pius Man?